Disclosure: I did not receive any form of compensation to help promote this contest. All opinions stated are my own. 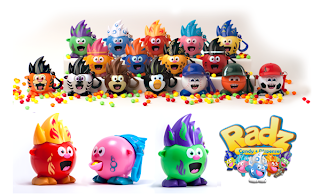 I blogged a bit about Radz at Easter time because I thought it was the perfect treat to add to a child's basket. Cute little candy dispensers (that now also come with college team logos, woohoo! ), Radz are adorable, and they're fun for the kiddos. Now Radz is celebrating back-to-school with a giveaway on their Facebook page. They are giving away an iPad mini and two Series 1 characters (nice, huh?!?). The contest runs the entire month of September. I so want an iPad Mini....someday. Looks like a fun giveaway. Great giveaway! I really want an ipad, so totally going to enter this one! never heard of these...need to check it out.. I remember your post about these Radz. I just got an iPad about 3 months ago.